The new yonex Vcore range is known as the 'new shape of spin' it has the latest technology including the drag-reducing Aero Trench and Liner Tech allowing the strings to enter the racket at a straighter angle to create easy spin. 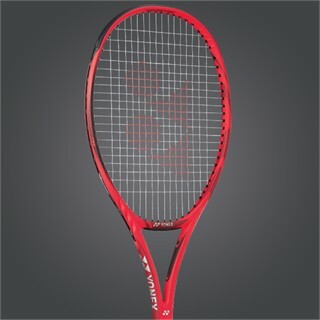 The Isometric head allows an increase in the number of main and cross strings that meet in the centre of the racket to produce a larger sweet spot giving a 7% more effective hitting area. The LinerTech creates a larger snapback due to the reducing the string entry angles in selected grommets, the outer main strings are elongated. The added string movement allows players to grab the ball to apply extra spin. Free delivery available on Yonex VCore 95 2018! Order now! Do you own the Yonex VCore 95 2018?